After an 8 (or so) month long break, I felt the urge to make another doll quilt for Phoebe. I was inspired once again by Jen’s photos from the International Quilt Festival in Tokyo. This one in particular was whispering doll quilt in my ear. I thought it was perfect because it’s the sort of thing that is awe-inspiringly crazy in a full size quilt but seems kind of quaint and homey in a doll size quilt. I also liked that it was another “+” thing, like the quilt that inspired the first quilt I did for Phoebe’s wall. Further inspired by Jen and her post on hand-piecing on Sew, Mama, Sew I decided to ditch the sewing machine and finish piecing it together by hand. It was lovely. Just the right sort of project (tiny) for some relaxing handiwork. The quilting was fun too although I got a little too distracted by the tv (buffy) and my +’s sort of sway off grid a bit. But I love the finished product. I knew I couldn’t go wrong when I picked these fabrics and the pink, black and green color scheme. I’ve had most of these fabrics in a pile for a project for, um, over 2 years now I think. So even if I totally botched it I’d be happy with the pretty colors. here are some details: the finished size is 14″ x 18″, the squares are 2″, cotton batting, vintage bias tape, perle cotton for the quilting, vintage and new fabrics. Those +’s are so cute! I think that your quilt wall is really amazing! And that Phoebe is pretty darn cute too! I adore the + quilting! I will definitely have to try that. Very cute! And I mean Phoebe most of all! So pretty! And the non-tie ties are such a nice detail. Phoebe is so cute. I love that expression of baby angst! Wow! Your right about those colors. They look amazing together and what a great job on the handquilting. Lovley! The quilt is so charming,and the +’s are a plus! It all looks fantastic together! Phoebe looks excited too about her new quilt. I love the fabric/colorway of this quilt… the quilting reminds me of the way my great grandmother used to quilt her crazy quilts. PS Phoebe is so darn cute… love that hair. Your Phoebe is darling, for sure! I have a 15 month old, and she won’t ever leave my lovingly (if clumsily) crafted clips in her hair. You’re lucky you have a willing model. And I LOVE the quilt. Great fabrics, beautiful colors. Phoebe is growing like a weed! What a lovely wee one you have. 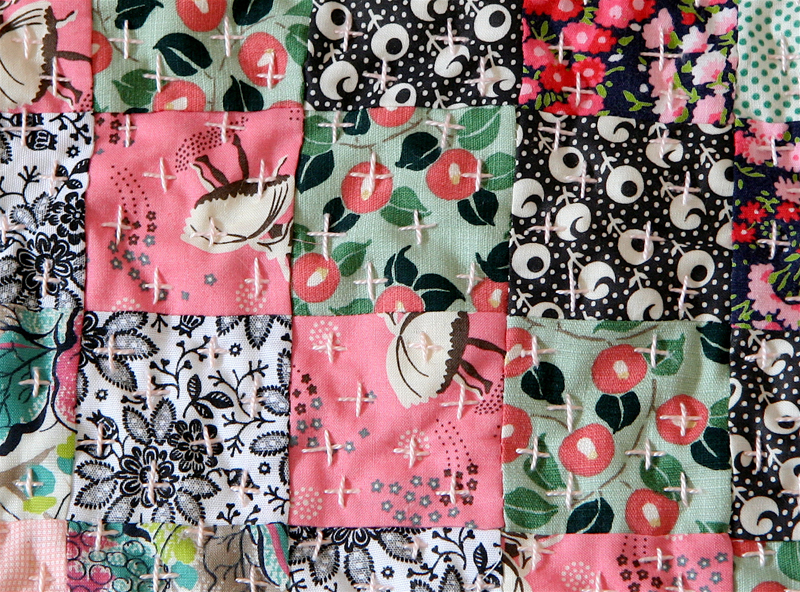 Cute quilt – you have a even cuter little girl! Beautiful quilt and beautiful Phoebe! Did you do all of the horizontals & then verticals? Or did you do individual “+” marks? so cute! (both the quilt and phoebe) i’m so glad you came back to doll quilts. i knew something was missing in my life! To wake up to that sweet little face everyday. What a little angel! The quilt is lovely too. Beautiful quilt, but even more beautiful baby! How do you do the +’s?? Do you tie each on off? What does the back look like? I’m doing a baby quilt and this would take so much less time then hand quilting it as I was planning. What a sweet project for handwork. It is just beautiful. And the face on your girl. What a peach! Beautiful quilt – I love the color combinations and pattern. Beautiful little girl, too! Phoebe is so cute! It looks like she’s anxiously awaiting your next move. She is SO cute!!! Lovely quilt! Just love the colors! I would also be delighted to know how to do the +’s. They are just great and I’m working on a quilt right now where they would look so good. Do tell. amy, yes I did the horizontals, then the verticals and I sewed through the top and the batting and then attached the back with the binding so it isn’t quilted all the way through. don’t think it would work well for a baby quilt or anything bigger than tiny. Phoebe is getting so big! And I love the quilt. Tiny things are so much quicker and so much more instant in their gratification. Such pretty colors! Just lovely! I love the detail of the stitches! Truly made with love! I love the little quilt, and Phoebe is so cute! I love her hair! 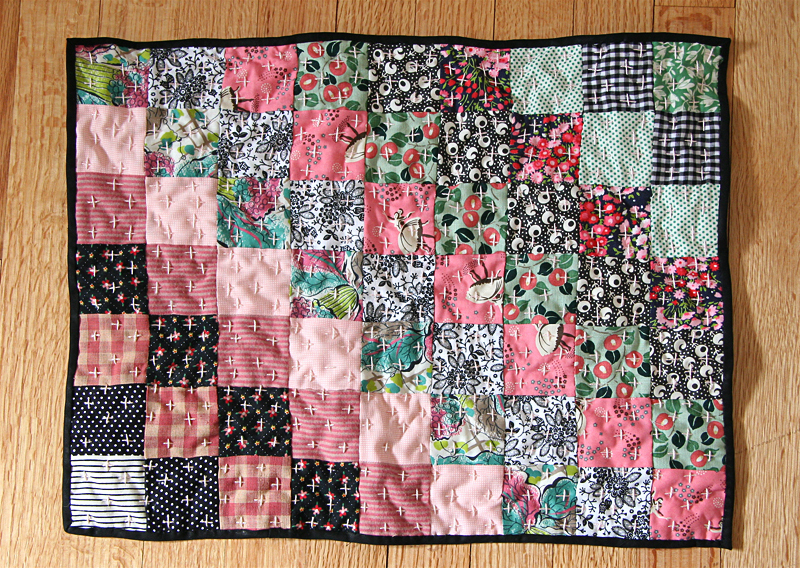 Great job on the hand quilting – it doesn’t matter if the +’s are a little off – it’s really nice! What a sweet quilt and beautiful baby! Oh, awesome. Pheebs is like, “Hey man, that ain’t gonna cover me.” What a cutie. Love the quilt! Glad to hear I’m not the only one who crafts while watching buffy. Just because she’s adorable you mean, right? What a cutie! wow, I am loving the look of those prints together and the quilting fits it so perfectly. Phoebe is an absolute cutiepie. I absolutely love the quilt!